Not long after the 1906 Santa Rosa Earthquake, plans were underway to build a replacement courthouse and firehouse downtown, both critical buildings destroyed by the quake or fire. For the courthouse, which also held the offices for county officials, no expense was spared; financed by a whopping $280,000 bond, the building was artistic and grand, even palatial. For the firemen, an adequate replacement building would have to do. 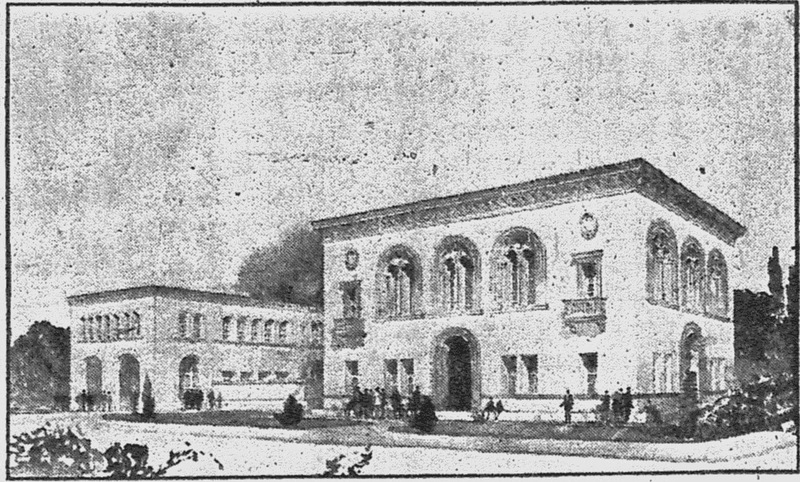 Plans for a state-of-the-art firehouse and adjacent City Hall were drawn up by John Galen Howard, one of the most respected architects on the West Coast, who had recently designed the Empire Building (then the Santa Rosa Bank) downtown. From the drawing that appeared in the newspapers, the design was in the same style as that building - sans the out-of-scale retro clock tower. Alas. Santa Rosa went on the cheap. John Galen Howard's buildings were to be funded by a $75,000 public bond, but a bond issue was never placed before the voters. The City Council quietly decided instead to build a modest firehouse at the old Fifth Street location, using only the $11,000 in the town's building fund. As explained by the Press Democrat, selling firehouse bonds was actually Plan B. The original idea was that local banks would jointly provide a special loan to the city to be paid back through the general fund over many years. But lenders everywhere turned skittish after the Bank Panic of 1907, which nearly brought about the collapse of the U.S. economy. There also may have been political problems. The new firehouse/city hall was to be on the corner of Third and Main Street - now the B of A building, but at the time it was the former location of the Grand Hotel, and owned by the Savings Bank of Santa Rosa. This bank was controlled by the current mayor (J. P. Overton) and Con Shea, who separately owned much of the prime real estate downtown. The bond called for paying them the rather large sum of $18,000 for a parcel that nobody else apparently wanted; in 1908 it was still mostly a vacant lot, with a small Salvation Army chapel. Buying the land and building there became somewhat of an issue during the 1908 city election campaigns, when reformers trying to oust the "good ol' boys" questioned the wisdom of bonding the town for another $75,000 and purchasing overpriced land when the city already owned the old firehouse site on Fifth St. and the former City Hall site on Hinton Ave.
Another factor might have been that some felt the Third and Main Street location was also on the "wrong" side of town, adjacent to the little Chinatown on Second and the red light district on First Street. And directly next door, the unsightly earthquake wreckage of the Eagle Hotel still remained, despite complaints to the City Council. But the John Galen Howard plans were abandoned sometime in early 1908, becoming yet another of Santa Rosa's lost opportunities. The new firehouse/city hall would have been kitty-corner from Howard's Empire Building, and the three buildings together would have given the neglected side of downtown something of the elegant feel of UC/Berkeley, which was being created by Howard at the same time. The above picture shows the proposed new city hall for Santa Rosa and also the proposed new fire station from the plans adopted by the City Council and prepared by Howard & Galloway, engineers and architects of San Francisco. Both buildings are to replace those destroyed in disaster of the memorable morning of April 18, 1906. Both buildings are confessedly much needed, and the City Council has decided to submit the question of voting bonds in the sum of $75,000 for the purchase of the site, erections of buildings etc. The buildings will cost not to exceed $60,000. The matter of issuing bonds will be submitted to the voters of Santa Rosa at the municipal selection to be held in this city in April. The city hall will be a commodious building, two stories high, and will be built of steel and reinforced concrete. The steel frame will be a massive one. It will contain the offices for the several city officials, police department, Jail, council chambers and public hall. The public hall will be located in the second story. The Mayor, members of the council and the architect in the consideration of the plans have arranged to have the building modern in every particular and one of which the citizens and taxpayers will be proud. The fire department building (the smaller of the two shown in the picture) will be located on the same site as the City Hall. The ground floor will be used for the firefighting apparatus, and the stabling of the horses. The upper story will be devoted to the sleeping and living quarters of the firemen. Like the city hall the new fire station is an absolute necessity and much time has been spent by fire chief Frank Muther, the mayor and council and the architect in having the department housed in a building that will be second to none in point of usefulness and modern equipment in the state. As is well known it was first planned that the financing of the erection and equipment of the municipal buildings should be undertaken by a combination of banks in Santa Rosa, and when completed the city was to pay them back in yearly installments from the general tax fund. With this idea in view the city council is making the tax levy for this year set aside $10,000 which is now in the building fund. Owing to the recent financial flurry, however, the banks did not feel at liberty at this time to assume the obligation. Councilman Forgett stated that he had expected to have the plans for the steel frame of the new fire house on hand, but one of the firms had failed to come through and he desired that the matter go over. Mr. Kirby had was present and explained his plans for an all-steel frame building. The building on these plans was not to cost over $11,000. Plans and specifications have been adopted for the fire department station on the city slot on Fifth street. Action was taken at last night's meeting of the city council. Bids were also invited for construction of the same. The building will be of steel and brick. Separate bids were invited for the supplying and erection of the steel frame and for the brick work and completion of the building. Mrs. Sadie McCann prepared the plans under the direction of the structure committee of which Councilman Forgett is chairman. They provide for a neat and imposing building. Chairman Forgett of the structure committee declared flushes were required in the fire department houses for the stalls. Is necessary to flush these stalls frequently and cause fresh water to remain in the traps to be sanitary. He reported good progress being made on the fire house structure. The council deemed the flushes a necessity and referred the matter to the structure committee with powers to act.